Eco-friendly trap-bait for control of olive tree fly (Batrocera oleae). It consists of a 15×20 cm green cardboard wrapping with ammoniun bicarbonate (food attractant), externally impregnated with Deltamethrin (insecticide). In order to increase its attraction power, it comes along with a dispenser with a sexual pheromone. It is based on the “attract and kill” method without the need of fly traps: flies lie onto the trap and shortly afterwards, they die. Compatible with the eco-friendly European production. Do not apply on fruit. It does not leave waste and it uses little doses of insecticide of very low environmental impact. ECO-TRAP is supplied in boxes of 100 traps plus bait. 1 unit/tree, for very big trees, from 100 to 150 trees/ha. 1 unit every 2 trees, for plantation densities from 200 to 400 trees/ha. 1 unit every 3-4 trees, for plantation densities from 600 to 800 trees/ha. Reinforcement units may be necessary by the end of August if high levels of plague are detected. If you have any questions about the units to be used or other queries, ask the technicians at PROBODELT. 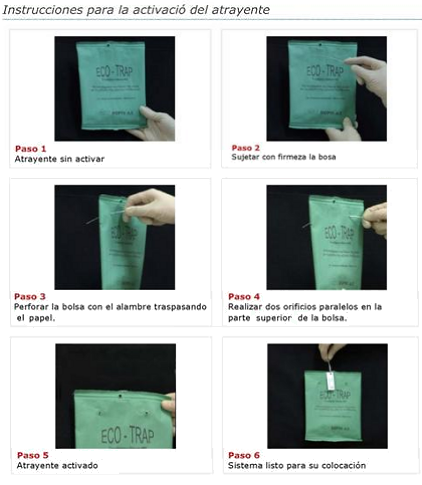 For activation of ECO-TRAP, the bag must be perforated as well as the upper part of the pheromone capsule with a wire of approximately 1 mm diameter. The same wire will be used to hold the pheromone on the ECO-TRAP and at the same, to hang the whole set from an interior branch, mid-way to the top, in a shady position, free from contact with leaves and branches. Do not remove the ECO-TRAP until the end of the olive harvest. “Attract and Kill Method Using Ecotraps for Controlling Olive Fruit Fly in Albania“. J. Tedeschini, E. Isufi, R. Uka, M. Baçaj, D. Pfeiffer. Plant Protection Institute, Albania, 2002. “Alternative methods for controlling of olive fly B. oleae involving semiochemicals“. O. Jones et al. 2002. IOBC wprs Butlletin Vol 25. “Integrated Pest Manegement Package on Olive Fruit Fly Control in Albania“. J. Tedeschini, D. Stamo, D. Pfeiffer. Plant Protection Institute, Albània, 2002. 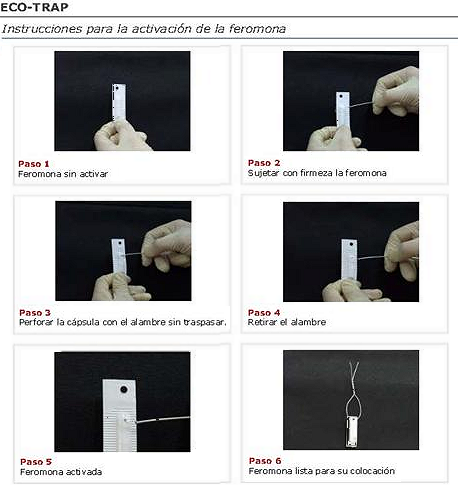 “Ensayo de trampeo masivo de la mosca del olivo con Eco-Trap“. J. Crespo, M. A. San Nicolás, F. Villa, J. A. Sasot, J. Beltrán. Conferencia Internacional de IFOAM sobre Olivar Ecológico. JA, CAP, Sevilla. 2005.